Get :hankey: done! 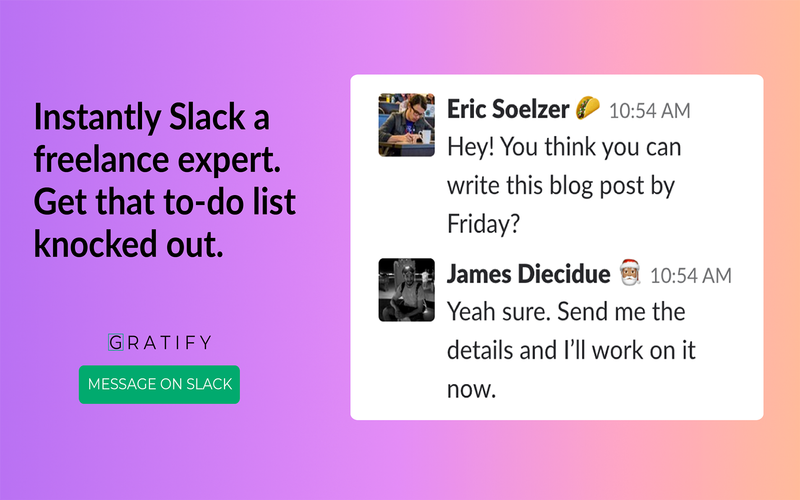 Use Gratify to find expert freelancers through Slack. 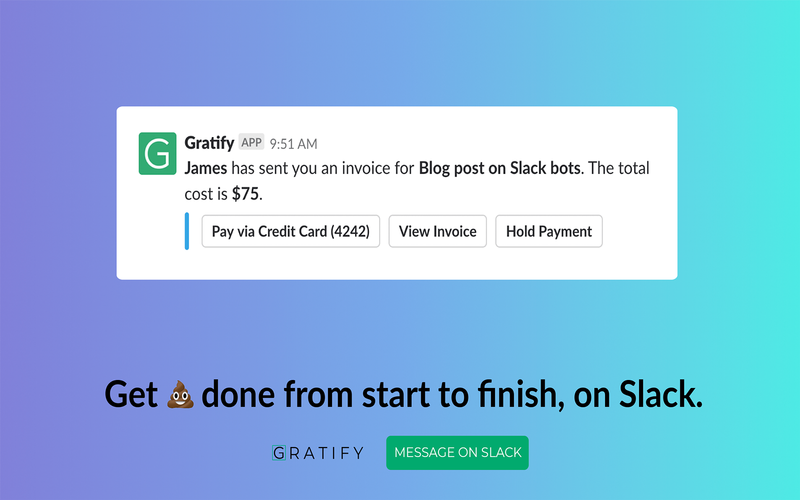 Gratify is a Slack-immersed alternative to freelance platforms like Upwork and Fiverr. Our closed-network of freelancers are vetted experts in their field. Over 90% of our experts are based in the US. 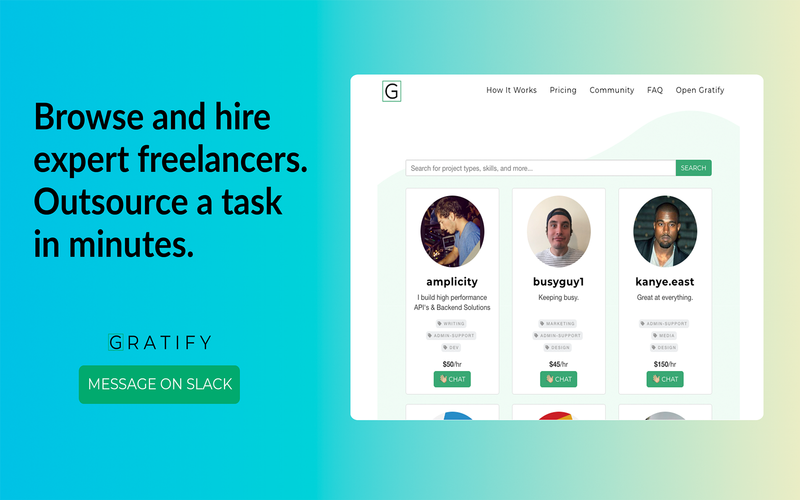 Message @gratify to post a task and auto-match with an expert or browse our directory of top experts via www.gratify.ai/scorecards.What types of tasks can you outsource on Gratify? Examples include..
- ...and most other technical workGratify is a combination of AI and humans. If @gratify does not understand your request, a human operator will respond. 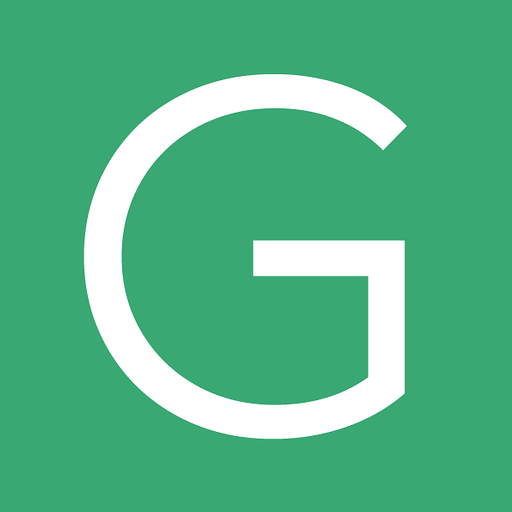 We provide 24/7 concierge and support for all of our users via the @gratify bot. Visit our FAQ (https://gratify.zendesk.com) for pricing and protection policies. 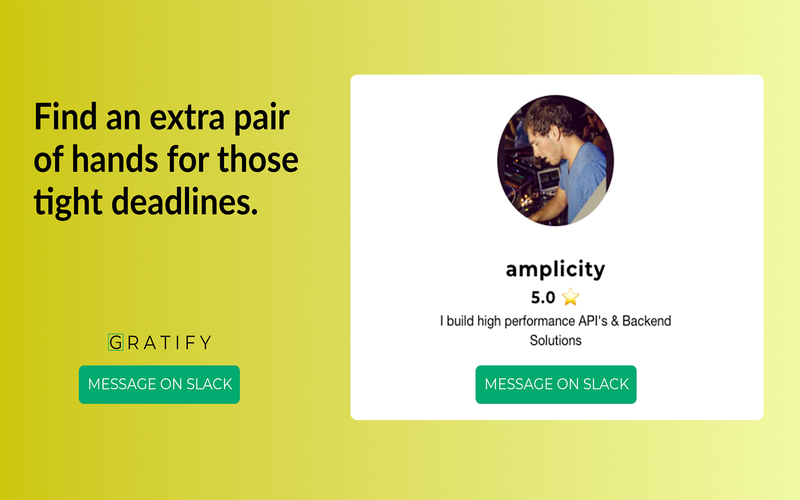 After installation, @gratify will appear in your Slack workspace. To begin, message @gratify 'help'. Have questions? Just message @gratify. A human will respond if necessary. Gratify will be able to view the email addresses of your Slack workspace’s members. Gratify will be able to modify information about your private channels, including name and purpose, as well as archive and create new ones. Gratify will be able to view your user id number, full name, and workspace id number on your workspace. Gratify will be able to modify information about your public channels, including name and purpose, as well as archive and create new ones. Gratify will be able to access basic information about your public channels (including names, topics, purposes, creation date, and latest message). Gratify will be able to install a bot user that appears in and has access to your workspace’s directory. It can also post messages and view activity on messages in any channel it is invited to. Gratify will be able to access profile information for all users on your workspace, including names and contact information.